Greetings, gardeners! We have changed our volunteer planting schedule to take place the Second Saturday of the month from 9:00 a.m. – 11:00 a.m. Hope to see you there! Pack your lunch and head to the Denton Community Demonstration Garden on the 4th Friday of every month from 12:30 p.m. – 1:00 p.m. for an enjoyable series of lunch-hour garden talks and demonstrations. The first “Garden Talk” of the season will kick off on Friday, July 26th with an overview of the development of Denton’s community garden, a public space that showcases edible plantings, sustainable agricultural techniques, and garden ecology. 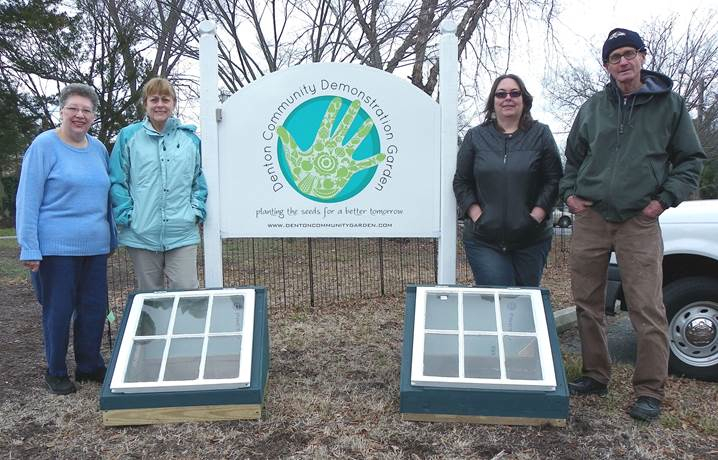 A big thank you to Rebuilding Together for their donation of two cold frames to the Denton Community Demonstration Garden! Spring is right around the corner, and we are excited to start planting! Join us for our first planting of kale, cabbage, broccoli, lettuce, swiss chard, beets, spinach, and potatoes on Thursday Mar 28 5:00 p.m.
Nancy Minahan was the featured speaker at the September “Garden Talks” series at the Denton Community Demonstration Garden. Nancy gave a presentation on canning vegetables. Check out the video below. – The underground cistern and pathways, a project of the Denton Development Corp. and the Town of Denton, has been completed. – With the help of Habitat for Humanity, the central garden platform installation is nearing completion. Only the handicap accessible connection from the platform to the pathway remains to be installed. – Decorative fencing has been purchased and is waiting to be installed. – A pergola has been made and is waiting to be installed. – The 6 garden boxes and 2 in-ground beds have been planted and harvested, with the food being distributed to the Samaritan House food bank. – A compost bin has been installed on the site. – A octagonal bench with a center flower box is being constructed by CCTC students. – 4th Friday garden talks have started on site. We hope to see you on Saturday September 8, your participation will help make this a successful community project. Please let me know if you plan to attend or, if you can’t attend, but are interested in actively participating in this project. Please feel free to forward this info to someone you think might be interested! Tables will be set up so that guests will be able to enjoy the garden talks and demonstrations during their lunch break. Discussion topics will range from gardening techniques to culinary creations inspired by the garden. The fourth Friday dates are July 27th, August 24th and September 28th and October 26th. The Denton Community Demonstration Garden, located by the municipal parking lot at 4th and Gay Streets in downtown Denton, is a community public space that showcases edible plantings, sustainable agricultural techniques, and garden ecology. The initial plantings of the community garden involve Square Foot Gardening, a technique that allows gardeners to cultivate small but intensively planted gardens. The garden also provides a venue for social and cultural exchanges through learning about food security, nutrition, and cooking. If you are an individual, school group, club or organization that is interested in participating in the seasonal planting, maintenance, harvesting, food processing distribution or marketing necessary to sustain a productive garden, please call 410.479.1009 or email dentoncommunitygarden@gmail.com. For those looking to make a donation, there is also a wish list of gardening items online at www.dentoncommunitygarden.com. The Denton Community Demonstration Garden has been made possible by funding from the Caroline Human Services Council and the Woman’s Club of Denton and through the support of countless volunteers and organizations. Thank you for helping us plant the seeds for a better tomorrow. Community Garden Meeting Tonight, May 15th! Looking to get involved in the Denton Community Demonstration Garden? Join us tonight at the Foundry, 401 Market Street in Denton, for any (or all) of the meetings listed below! 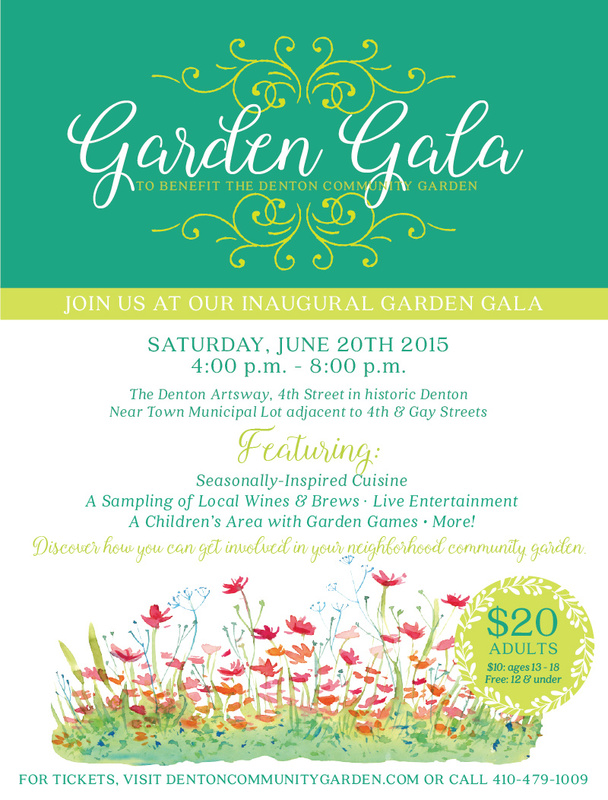 6:00pm: Promoters – help us get the word out about the garden. 7:00pm: Plant ‘n’ Tenders –help anticipate and address garden maintenance issues. 8:00pm: Builders committee – help us make the concept a reality. These meetings will be held on the third Tuesday of every month. For more information, call 410.479.1009. Hope to see you there!